We deal in CS Lined Pipes from size ranging from 1" to 18", of varying lengths, passed through thorough quality checks and test reports. 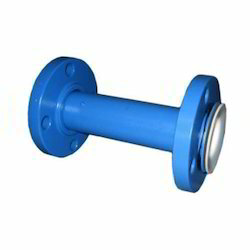 PTFE Lined Pipes comes with one End Loose Flange and one End Fixed Flange. we have been able to provide the customers with an impeccable range of CS PTFE Lined Pipes. Manufactured using high grade raw material, advent tools and sophisticated technologies, our range is widely used in diverse industrial applications. The raw material used during the fabrication process is sourced from reputed vendors such as DuPont. Offered in varied sizes & specifications, the range can also be customized as per the clients' requirements. Carving a niche for the organization, we are engaged in bringing forth a quality assured range of CS PTFE Jacketed Pipe. Precisely engineered using high grade raw material, advent tools and sophisticated technologies, the range is known for dimensional accuracy, reliability, high strength, corrosion resistance and durability. 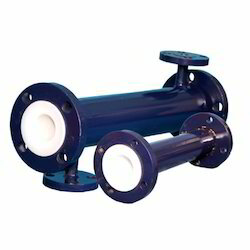 We are engaged in providing the customers with a commendable collection of CS PP Lined Pipes. Fabricated using advanced cutting edge technology, the range strictly complies with the predefined standards of the market. Widely appreciated for their efficiency, easy installation, corrosion resistance and longer service life, the range is widely used in diverse industrial applications. Cyclone Machine are designed for separation not only for droplets from gases and vapours, but also for particulate solids form gases. The overall degree of separation can be as high as 99% but this figure is governed to a large extent by the following factors. DN DN1 DN2 DN3 DN4 L L1 L2 L3 L4 L5 Cat.Ref.